Anyone who’s visited the mind-blowing financial, crime and movie capital of India, Mumbai, knows it to be a transforming and transformative place that tells of centuries of multicultural layering, a miracle of urban concentration well past imaginable limits of popular saturation, and a global leader in all manner of spectacle. That its latest spectacle is one of terrorism on a dramatic –almost cinematic– scale is a sad realization that baptism into the corridors of world leadership sometimes means acceptance of the plagues of affluence. On the verge of becoming one of the wealthiest nations in the world, India –always a hotbed of terrorism– is now a more seductive target than ever. This week, armed gunmen brazenly killed more than a hundred random citizens and have taken hostages –mostly foreigners– in some of the city’s top hotels. 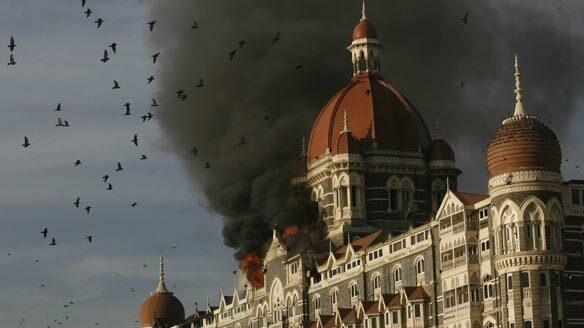 The most recent news is that the Taj Hotel was “liberated” by Indian security forces, killing a few of the gunmen in the process. The Taj has its own fascinating history. Its founder was once, due to his skin colour, denied lodging in a British hotel in Mumbai whose name escapes my memory. So he vowed to one day build the grandest hotel in the country to outshine that of the British. He succeeded. It was a small taste of the grandeur that would be modern India’s financial future. And so it’s a tad ironic and even more tragic that the Taj would serve as the site of modern India’s first urban bloodbath on the world stage. The world media is focusing on the gunmen’s targeting of foreigners, mostly American and British. But, as in all such stories, it’s the local small people who bear the brunt of the villainy. The gunmen opened fire on a crowded commuter train. These trains are not like subway trains in the West; they are so jam-packed that bodies sometimes hang outside the doors. They are the arteries, not for the wealthy and foreign, but for the poor and working class. Mumbai, you must remember, is held aloft by oceans of destitute poor, many of whom sleep and work on the sidewalks. This is, of course, a horrible, foul series of crimes. But in a few months, when these bodies have been cremated and the relatives have slouched off to try to rebuild their lives, a new thing will arise. Terror and murder in India is a circular event. As sure as night follows day, this act of terror will be answered by an equally horrid attack by Hindu extremists on Muslim neighbourhoods somewhere in India. It won’t make the world news because men in suits won’t be affected; but more lives are sure to be destroyed. There is strong evidence that this week’s events were spurred by foreign meddling, possibly from immediately north of India. But India has enough of its own home-grown nuts and murderers and would-be village Napoleans that domestic organized violence will continue to be its weak underbelly for at least another generation. Yes, they can build a nuclear weapon and put a spacecraft on the Moon. How about showing me some real advancement? How about showing me that they can keep their people safe? Aside… unsurprisingly, the gunmen also targeted Mumbai’s Jewish centre, one run by the Chabad Lubavitch. If indeed Pakistan is found to be complicit in this event, I’ll be curious to see how Israel responds.